Oklahoma City startup Buzzam is currently accelerating at the new Blueprint for Business accelerator in OKC. In fact Buzzam is the only homegrown team in the BluePrint For Business accelerator, other teams hail from as far away as London and Alabama. Buzzam promises a whole new way of listening and enjoying some of your favorite online radio sources. The iOS app, which is available as of today, integrates seamlessly with your iTunes, Rdio and Spotify accounts insuring that you’re never without your favorite music regardless of the source. It doesn’t stop there though. Buzzam is offering a new kind of radio, similar to original terrestrial radio, in that Buzzam will deliver information that is relevant to you, the listener. But we aren’t talking about relevant information to an international radio listening audience, a national listening audience or even a local audience. Buzzam will deliver information that’s relevant to just you. Buzzam will create a radio listening experience for you based on your favorite Rdio and Spotify channels and your iTunes music. What happens in between songs is what makes Buzzam truly unique. Buzzam’s dj service will deliver your Facebook and Twitter updates right to you while you’re enjoying your favorite music. Using Buzzam’s proprietary and patent pending technology, all your important social data is broadcast in between songs no matter what the feed. On a recent visit to Blueprint for Business even Brad Feld thought Buzzam was a cool idea. We got a chance to talk with Greg Starling, co-founder and COO of Buzzam about this innovative new radio idea ( and you know how we love radio ideas). Check out the interview below. 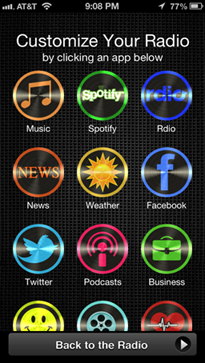 Buzzam is activity aware radio wrapping music, social feeds, and relevant news around your lifestyle. Available as an iOS app, it’s patent pending technology seamlessly integrates with iTunes, Rdio, and Spotify ensuring you always have custom radio at your fingertips. Tell Buzzam what you want to hear and when you want to hear it. Choose from dozens of major information sources and let Buzzam take your selections and create a listening experience unique to you. In between songs, your DJ updates you with the latest from Facebook and Twitter while mixing in headline news, sports, and weather. Josh is the software developer behind Buzzam. He began his college education in Nashville, TN studying Music Business at Belmont University. After two years of studies and another year of touring, he undertook a massive career change and completed a Computer Science Engineering degree at the University of Oklahoma. Since then Josh founded Bendy Tree LLC, a software and media company that has built dozens of apps for the iTunes app store. Greg runs the business side of Buzzam. Like Josh, he also attended the University of Oklahoma where he majored in marketing. Recruited out of college to found an eCommerce division of Hobby Lobby stores. Greg went on to take a position at MTM Recognition where he was charged with creating a web department. Here, Greg worked his way up to be named the youngest Vice President in company history. What is the startup culture like in Oklahoma City? Oklahoma City’s startup community is young but growing. There is a solid core of tech startups leading the way with two accelerators and an Oklahoma government sponsored incubator bringing in talented companies from all over the world. What problem does your Buzzam solve? Today, radio is push medium where generalized information is pushed to users on a particular station’s schedule in a manner appealing to the broadest possible audience. Internet Radio and music libraries on the other hand isolate users from what’s happening around them. Buzzam is the only application that is pulling user defined information into a user’s music of choice and delivering on the schedule the user wants to receive it. There have been too many people in our lives who have helped get us to the point to name them all, but some who have really shaped our thinking: Brad Feld who gave us confidence to build our company in OKC. Tony Hsieh who showed people that culture and service trump everything. Elon Musk who over and over risked everything to accomplish something great. What’s one thing the world doesn’t know about you or Buzzam? We started over two years ago on this project and just the iOS code alone has over 1.5 million lines of code edits. Listen to customers and rapidly respond to our user base.